A classically designed corner summerhouse in a traditional pent roofed pentagonal style, the Kirton offers a good choice of sizes in a quality finish. In addition you can choose between a Georgian window style (illustrated) or a square leaded type finish - both offer real character. The pentagonal design allows the Kirton to fit neatly into any corner of the garden while the building offers generous headroom and plenty ventilation on a hot day by virtue of its outward opening windows. The double doors offer plenty of access and the large glazed doors and windows ensure a bright and sunny interior. The Kirton is finished in 16mm smooth tongue and groove cladding which is mounted on substantial 38 x 50mm framing. The roof and floor also comprise 125 x 16mm for strength and durability and for good measure the roof is finished in roofing felt for weatherproofing. All wood comes from FSC approved sources. The doors and windows are secured with black japanned fittings for and attractive finish and the pent roof slopes to the rear to allow water to drain off well away from the front door. The Kirton is available in a choice of three sizes; the relatively compact 7' x 7' (2.13 x 2.13m), the spacious 8' x 8' (2.44 x 2.44m) and the exceptionally spacious 10' x 10' (3.05 x 3.05m). The roof height is a generous 6'3'' (1.9m) at the eaves rising to 7'1'' (2.16m) at the highest point in all models. 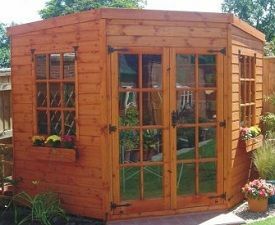 The summerhouse is supplied pre-treated with a light oak factory dip. While this will protect the building adequately up to the point of delivery it will be necessary to apply a suitable decorative/protective finish at the time of assembly or very shortly thereafter. This finish will require to be maintained on a regular basis throughout the life of the building. As mentioned above the Kirton is available in a choice of Georgian style or square leaded glazing. The summerhouse will be delivered ready for DIY assembly by the purchaser. The structure comprises framework panels to keep construction work to a minimum. The Kirton is certainly an attractive corner summerhouse of its type. The pentagonal design allows it to fit neatly into a garden corner - a particular bonus where space is limited - and the choice of three sizes means that you should be able to find a model to fit the space available. All three models are spacious internally with generous headroom while the 10' x 10' model is as large as you are likely to need. There are cheaper summerhouses around but it's worth noting that the 16mm cladding and 38 x 50mm framing of the Kirton are higher spec than most cheaper models. In addition the wood is planed smooth and looks quality throughout. The tongue and groove roof and floor are to be preferred to OSB sheet alternatives from the point of view of durability. All in all the Kirton compares well with its rivals in this size and price range and should serve you well if properly looked after. If you own an A1 Kirton Corner Summerhouse we'd be delighted if you'd submit a review to help other prospective customers. You can do this on our Corner Summerhouse Review Form - we look forward to hearing from you.